How to optimize videos for my web site? Large videos are not just bad for overall page load times and provide a negative user experience, they can also negatively impact your site’s SEO as fast page load times are an important factor that Google and others take into consideration. Therefore, compressing videos before using them on a website is the way to go. Even though vooPlayer optimizes your uploaded files in many ways it's recommended that when possible, provide an optimal starting point for the process. It is important to ensure videos get accepted by as many browsers on as many phones, tables, laptops and operating system combos as possible. Unfortunately to-date, there is no one format/video codec/audio codec combination to rule them all. To ensure compatibility with most browsers and devices, our best recommendation is to convert videos to MP4 before using them on websites and encode them with H.264 codec. Just like images, videos should be optimized for the web. Many video uploads and especially self-hosted videos fail to stream quickly and often pause during playback. Fortunately, there are plenty of programs that will reformat videos, rearranging file settings for faster playback, which helps them stream more smoothly across a multitude of devices. 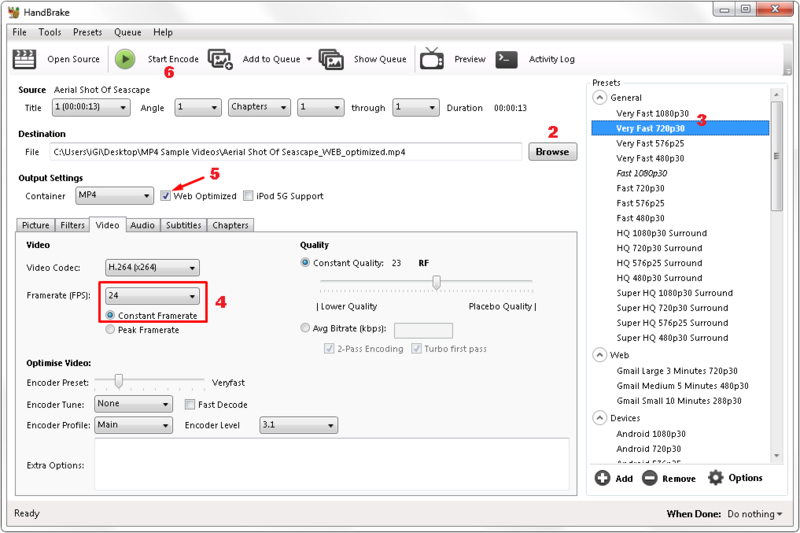 Our best recommendation is a free software program called Handbrake, an open source video transcoder.